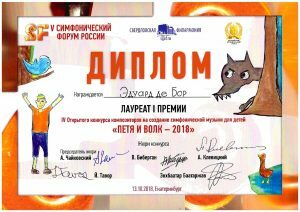 First performance: October 13, 2018, as part of the final concert of the Peter and the Wolf composition competition for music for children 2018 in Yekaterinburg. Performers: the Ural Youth Symphony Orchestra conducted by maestro Enkhe; narrator: Irina Nesterova. With subtitles. To my great joy, this composition won the first prize, out of more than 50 entries from all over the world! There are wonderful compositions for children, where, each in turn, the various instruments of the symphony orchestra are highlighted, Benjamin Britten’s A Young Person’s Guide to the Orchestra being the most well-known. But, as far as I know, no composition for children existed so far, where instead of the various instruments the most usual modes of playing – apart from ‘normal’ playing – are highlighted, like for instance pizzicato, tremolo or sul ponticello for strings, flatterzunge for wind instruments, playing with or without mute, etc. All these and similar modes of playing evoke each their own specific atmospheres. For years, it had been a wish of mine to devote a piece of music for children – and their (grand)parents – to this subject. This composition is the result of this wish. The person who started the chain of events that made it possible to realize this idea is Kees Kramer. artistic coordinator of the Rotterdam Philharmonic Orchestra. The idea appealed to him and so he presented it to the orchestra’s coordinator education Katinka Reinders, who also liked it. This eventually resulted in a commission by the Dutch Fund for the Podium Arts to compose music for a children’s show. The composition The Symphonic Colour Factory has been derived from the music for this show. Like Britten’s A Young Person’s Guide, this piece can be performed with or without a narrator. The difference is that my composition illustrates a story (see below), implying that it can be seen as programme music, when performed without narrator. As can be seen below, the narrator’s text doesn’t explain complex terms like harmonics or sul ponticello. All these effects can either be explained beforehand in school classes as a preparation for a concert where this piece is on the programme, or they can be demonstrated during a concert, just before the composition is performed, or both. Here I would like to add that to me, the cognitive side (like knowing what col legno means) is far less important than experiencing how certain ways of playing sound and what kind of atmospheres can be evoked by them. Obviously, I had to make choices which modes of playing I would use. One could easily compose a substantial piece for string orchestra alone, in which all kinds of modes of playing are highlighted. Or a piece for brass alone, focussing solely on the many types of mutes that are available. I also had to make choices in what way to introduce things. For instance: the pizzicato effect is introduced in combination with loud chords. Had I presented it with soft single notes, this would have resulted in a very different atmosphere. I made this choice, because I felt the need to have something that would contrast effects that are soft by nature, like sul ponticello or col legno. Narrator: Katinka was a lively girl, with a keen interest in many things. Fortunately, she landed softly. She looked around. Where was she? Apparently, in some sort of strange-looking building. She could feel it was a place full of magic. Tentatively, she took a few steps, and then she saw a door, with a shield that read: MATERIAL: WOOD, BRASS, STRINGS, MISCELLANEOUS. She cautiously opened the door and entered a large hall. [II. Theme I.] She slowly walked through it. Indeed, there was the wood… and there the brass. And there were the strings… and there were indeed all kind of miscellaneous things. On the other end of the hall she found another door, also with a shield on it. It read: HARMONICS AND MUTES. CAREFUL. TEMPERATURE BELOW ZERO. She curiously opened the door and entered a large white hall. [III. Variation 1.] Indeed, there were lots of harmonics, and they emitted an icy cold. And there were a number of mutes as well. As she walked through the hall, Katinka became colder and colder. She became so cold, that she started running toward the exit door and quickly went out. [VI. Introduction to Variation 3.] ‘Did you hear that? It’s called triple tonguing. The flutes, trumpets and horns are particularly good at it. Would you like to go inside?’ ‘Oh yes, very much!’, Katinka replied. ‘There is a lot of activity going on there’, the guide continued. ‘Please also notice that the strings are being plucked. This is called pizzicato. All right, here we go!’ And he pushed open the door. ‘As you can hear, the strings can play equally fast repeated notes as the flutes and trumpets, and softly, too, if necessary, the guide added. Narrator: The leader now became aware that Katinka was still there, spellbound as she was by the spectacle. ‘I told you to leave!’ he shouted at her. Dragging her to the exit door, he pushed her out, slamming the door behind her. [XI. Theme II.] …but then, to her relief, she again saw her guide. ‘Ah, finally you can see me again’, he said. ‘Yes, some of the sounds from our Factory do sound scary, but there is nothing to be afraid of. Do you now hear the solo strings with mutes, moving the bow rapidly back and forth? This is called tremolo? Isn’t it beautiful? And now, all the other strings join in. This sounds a bit scary again. Now I would like you to be very quiet for a minute. So you can feel the sound of strings playing with the wooden side of the bow instead of with the hair. This is called col legno. [XIII. Theme II.] ‘And now it’s time for you to return, Katinka’, resumed the guide. ‘I will take you back to the exit point, along the same route back. I hope you liked like this sight-seeing tour, despite the scary moments?’ ‘O yes, very much so!’ Katinka cried. ‘Thank you so much!’ ‘I’m happy to hear that. All right, let’s go then.’ And off they went.